MBE Wealth Management, LLC ("MBE Wealth") is a Registered Investment Advisor ("RIA") with the U.S. Securities and Exchange Commission (“SEC”). 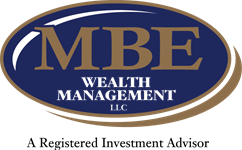 MBE Wealth provides investment advisory and related services for clients nationally. MBE Wealth will maintain all applicable registration and licenses as required by the various states in which MBE Wealth conducts business, as applicable. MBE Wealth renders individualized responses to persons in a particular state only after complying with all regulatory requirements, or pursuant to an applicable state exemption or exclusion. Please read these terms and conditions of use (“Terms”) carefully before using the website located at www.mbewealth.com (“Website”) or any of the information or services provided by MBE Wealth Management, LLC (collectively “MBE Wealth”, “we”, “our”, “us”) in connection with the Website. By using the Website, you acknowledge that you have read and understood these Terms and accept to be legally bound by them. If you do not accept and agree to these Terms, you are not an authorized user of the Website or any of the information or services provided by MBE Wealth in connection with the Website and should promptly terminate all use thereof. The terms “you” and “your” mean you and any entity you may represent in connection with the use of the Website. You may use your browser to download or print a copy of these Terms for your records. MBE Wealth reserves the right to change, modify, add or remove portions of these Terms at any time for any reason. We suggest that you review these Terms periodically for changes. Such changes shall be effective immediately upon posting. You acknowledge that by accessing our Website after we have posted changes to these Terms, you are agreeing to these Terms as modified. This website is intended to provide general information about MBE Wealth and its services. It is not intended to offer or deliver investment advice in any way. Information regarding investment services are provided solely to gain an understanding of our investment philosophy, our strategies and to be able to contact us for further information. Market data, articles and other content on this website are based on generally available information and are believed to be reliable. MBE Wealth does not guarantee the accuracy of the information contained in this website. The information is of a general nature and should not be construed as investment advice. Please remember that it remains your responsibility to advise MBE Wealth, in writing, if there are any changes in your personal/financial situation or investment objectives for the purpose of reviewing/evaluating/revising our previous recommendations and/or services, if you would like to impose, add, or to modify any reasonable restrictions to our investment advisory services. MBE Wealth will provide all prospective clients with a copy of our current Form ADV, Part 2A ("Disclosure Brochure") and the Brochure Supplement for each advisory person supporting a particular client. You may obtain a copy of these disclosures on the SEC website at http://adviserinfo.sec.gov or you may Contact Us to request a free copy via .pdf or hardcopy. MBE Wealth often communicates with its clients and prospective clients through electronic mail (“email”) and other electronic means. Your privacy and security are very important to us. MBE Wealth makes every effort to ensure that email communications do not contain sensitive information. We remind our clients and others not to send MBE Wealth private information over email. If you have sensitive data to deliver, we can provide secure means for such delivery. Please note: MBE Wealth does not accept trading or money movement instructions via email. As a registered investment advisor, MBE Wealth emails may be subject to inspection by the Chief Compliance Officer (“CCO”) of MBE Wealth or the securities regulators. If you have received an email from MBE Wealth in error, we ask that you contact the sender and destroy the email and its contents. MBE Wealth may utilize third-party websites, including social media websites, blogs and other interactive content. MBE Wealth considers all interactions with clients, prospective clients and the general public on these sites to be advertisements under the securities regulations. As such, MBE Wealth generally retains copies of information that MBE Wealth or third-parties may contribute to such sites. This information is subject to review and inspection by the CCO of MBE Wealth or the securities regulators. Information provided on these sites is for informational and/or educational purposes only and is not, in any way, to be considered investment advice nor a recommendation of any investment product. Advice may only be provided by MBE Wealth’s advisory persons after entering into an advisory agreement and provided MBE Wealth with all requested background and account information.